ATLANTA (August 26, 2014) -- For a unique team of Chick-fil-A and college football fans, Wednesday, Aug.13, night was the final countdown. They were the first 100 fans to visit the new Chick-fil-A restaurant inside the new College Football Hall of Fame and Chick-fil-A Fan Experience in downtown Atlanta, and they counted down the final 12 hours until the restaurant opened for business Thursday morning. Chick-fil-A holds a “First 100” event at every restaurant opening. Since 2003 excited customers have camped out in the parking lot of each new Chick-fil-A restaurant. The First 100 customers on the morning of the opening receive free Chick-fil-A for one year. 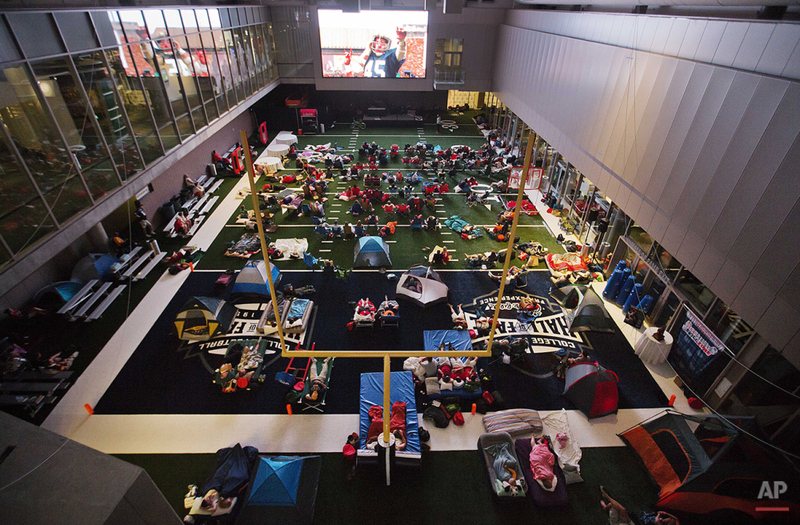 The First 100 experience at the College Football Hall of Fame was unique though, giving Chick-fil-A and football fans a chance to literally win their way onto the Hall’s indoor 45-yard football field. In July, a contest was held inviting college football fans from around the country to write a 250-word essay about their love of college football. The 100 winners earned a sneak peek of the Hall of Fame as well as a year of free Chick-fil-A food. Each winner was allowed to bring one guest, and they came from as far away as Hawaii. 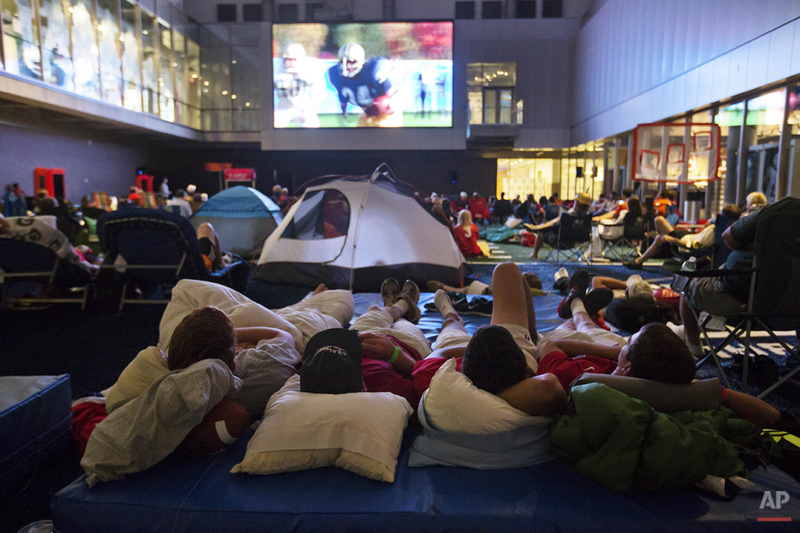 The crowd of 200 set up tents, enjoyed football and Chick-fil-A-themed entertainment. The First 100 saw the Helmet Wall get lit up for the first time and played football on the Chick-fil-A Peach Bowl Skill Zone, which is a 45-yard long football field that allows fans to sharpen their football skills through a variety of physical activities. The Skill Zone is just one of the interactive, multimedia exhibits that invite fans and visitors to engage with their favorite football team or Hall of Famer. The Chick-fil-A “Why We Love College Football” exhibit features iconic trophies and a large, touch-sensitive, 52-foot media wall filled with photos and videos of players, fans, cheerleaders and marching bands. A multi-touch system allows for interaction with content specific to a fan’s favorite college football team. The National Football Foundation & Chick-fil-A Building Leaders exhibit is all about the “good in the game.” It is a tribute to the mission and programs of the NFF and the positive impact the NFF has on the game. Fans will find stories about some of the society’s great leaders that point to the lessons they learned in football to achieve success in business, community and life. Even if you weren’t in the “First 100,” you can still be one of the first to visit the new downtown Chick-fil-A restaurant, which is now open, and to see the College Football Hall of Fame and Chick-fil-A Fan Experience when it opens on August 23. Get your tickets to the Hall of Fame here.